Fresh from breaking the UK under-15 shot put best in May with a 14.15m throw with the 3kg implement and then improving it to 14.34m in August, Hannah Molyneaux is keen to continue following in the footsteps of her coach, former Commonwealth champion Geoff Capes. The 14-year-old Nene Valley Harrier retained her English Schools crown in style in July with a throw of 13.71m, only missing the championship record by a 21cm margin. She more recently set a championship record at the England Athletics under-15 Championships, putting 14.22m to miss her UK age-group record by just 12cm. Hannah has topped the country’s shot put rankings for the last three years in her respective age groups, as well as finishing 2013 with the UK’s best under-13 discus throw. While she acknowledges her success so far, she is hungry for more. The Lincolnshire teenager has already tasted competition with athletes several years older than her at this year’s BUCS trials in Loughborough, where she competed in the under-18 event in the early part of the season. Hannah was originally coached by Paul Rees in Bournemouth, whom she credits for developing her shot put and discus technique and ultimately guiding her to English Schools success last year. A recent move to Lincoln and linking up with the holder of multiple Britain’s Strongest Man titles and the country’s most capped athlete, Geoff Capes, is already reaping dividends for her performance and conﬁdence levels. An average week’s training includes two throwing sessions and three gym workouts at Stamford and Stoke Roachford, as well as representing her school in netball and rounders. The schoolgirl trains with a small group of high-performing athletes, which she says serves to motivate her to always train and compete to the best of her ability. 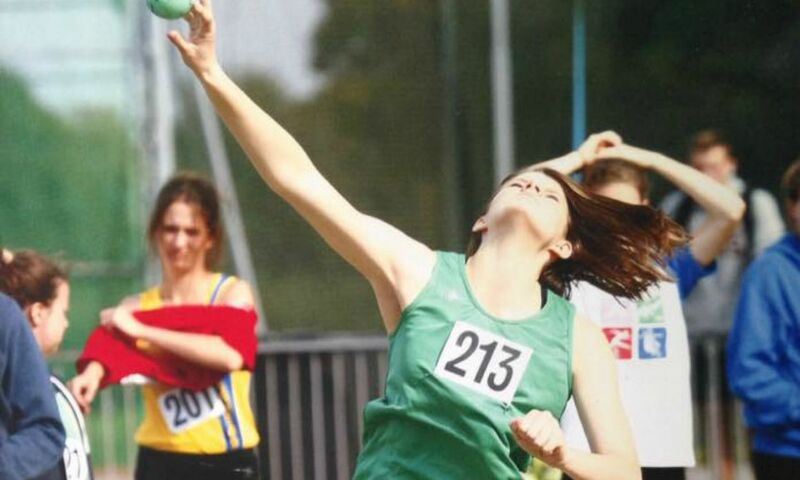 The multi-talented Lincolnshire county champion is realistic about the need to balance her shot put, and winter discus training, with her school work, but is conﬁdent she can continue to achieve a healthy balance when she begins her GCSE studies next year with the support of her parents and coaching group. Capes’s numerous Commonwealth and European indoor titles provide Hannah with plentiful competitive inspiration, but the youngster is also keen to point to her training partners as daily inspirational figures in her life. “On a personal level, I would say my greatest athletics attributes include dealing with pressure well, especially in big competitions, as well as having good long limbs for throws,” she adds. You can find further performance stats on Hannah on Power of 10 here.